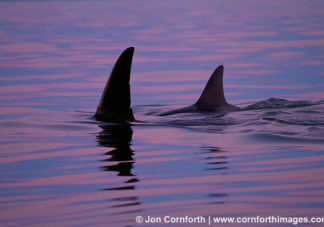 View orca (killer whale) photos, license orca (killer whale) stock pictures, and buy stunning orca (killer whale) prints by award winning professional photographer Jon Cornforth. To license an image for editorial or commercial use, click on the License Image button and fill out the form. To purchase a fine art print, select your image size and presentation style before clicking on the Buy Print button. The orca or killer whale (Orcinus orca) is the largest species of the oceanic dolphin family. It lives in all the world’s oceans, from the frigid Arctic and Antarctic regions to warm, tropical seas. Orca are versatile and opportunistic predators. Some populations feed mostly on fish, and other populations hunt marine mammals, including sea lions, seals, and even whales. Males typically range from 19-26ft (6-8m) and weigh in excess of 6 tons. Females are smaller, generally ranging from 16-23ft (5-7m) and weighing about 4-5 tons. The orca’s large size and strength make them among the fastest marine mammals, often reaching speeds above 35 mph. Unlike most dolphins, the pectoral fin of an orca is large and rounded—like a paddle. Mothers calve, with a single offspring, about once every five years. After that, all resident Orca pod members participate in the care of the young. Many orca live in the northeast Pacific Basin, where Canada curves into Alaska; off the coast of Iceland and off the coast of northern Norway. In Antarctic waters, they travel right up to the ice-pack. Experts believe that orca venture under the pack. There, they survive by breathing in air pockets like the beluga does. Each summer, the same resident orca appear off the coasts of British Columbia and Washington. After decades of research, scientists still don’t know where these animals go for the rest of the year. Many of the major aquariums have orca displays, but viewing and photographing them in the wild is much harder. The San Juan Islands offer the best opportunity to see wild orcas, but they can also be seen from northern Vancouver Island and in Alaska.